Bomba personnel carrying the body bag after the deceased was removed from underneath the iron pipe. MIRI: A man who failed to return home after he went out to check on his fishing trap on Sunday has been found dead after being crushed by a 40-feet long iron pipe in a drain near the Miri Septic Sludge Treatment plant behind Vista Perdana around 9.30am today. The deceased who has been identified as 57-year-old Ngau Wan Oyo was found by his wife this morning after he had failed to return home Sunday night. 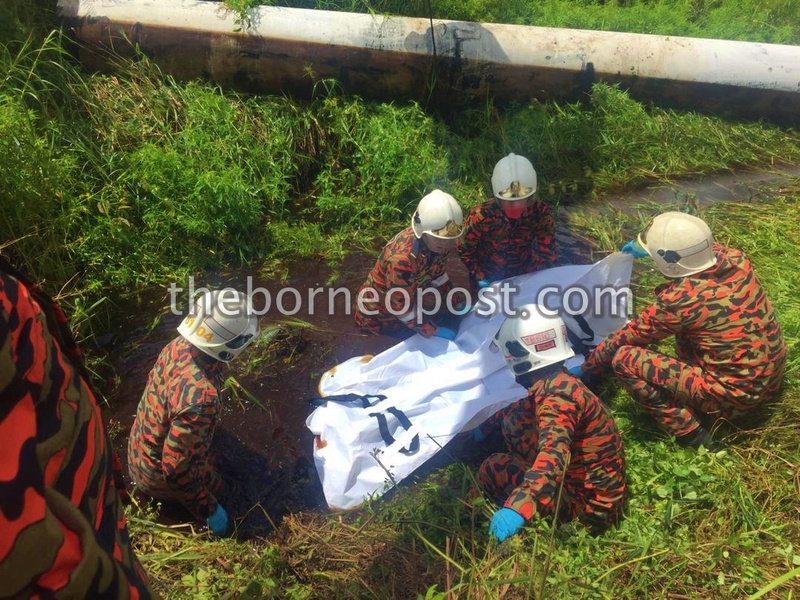 After receiving a distress call at 9.52am, a team of personnels from Lopeng Fire and Rescue station (Bomba Lopeng) was rushed to the scene where an excavator was used to remove the deceased from underneath the pipe. The operation ended at 11.20am. According to local authorities, the iron pipe was kept by the drain and rolled ontop of the victim as he was checking on his traps that were set in the drain.